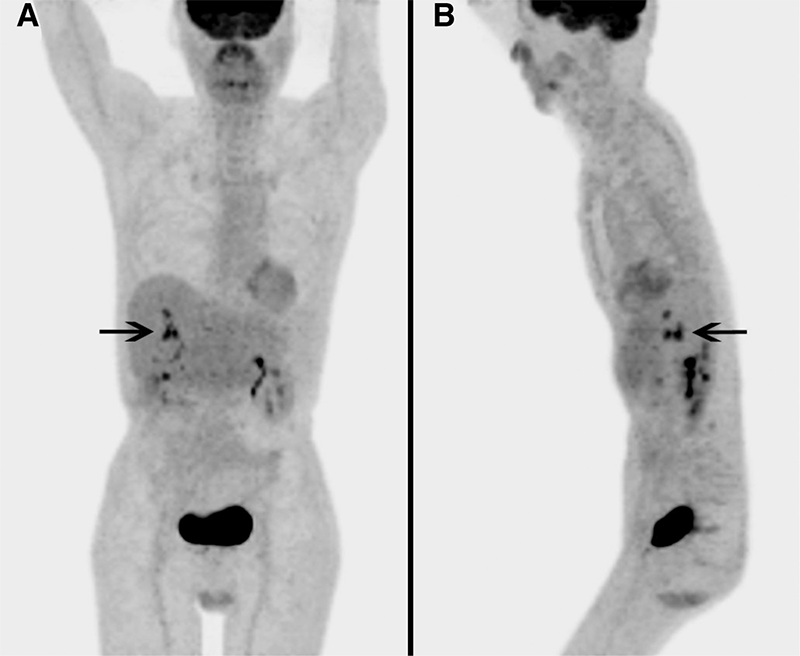 A 65-year-old male patient with a one year history of liver transplantation was referred for an 18F-fluoro-2-deoxy-D-glucose (18F-FDG) positron emission tomography/computed tomography (PET/CT) to rule out post transplant lymphoproliferative disease. Multiple foci of intense abnormal 18F-FDG uptake were seen in the transplanted liver which were concerning for malignancy. Explantation of the liver approximately 1 month following the PET/CT revealed multiple inflammatory and ischemic changes including large bile duct necrosis, acute cholangitis, bile duct obstruction changes and periportal fibrosis, with no evidence of malignancy. 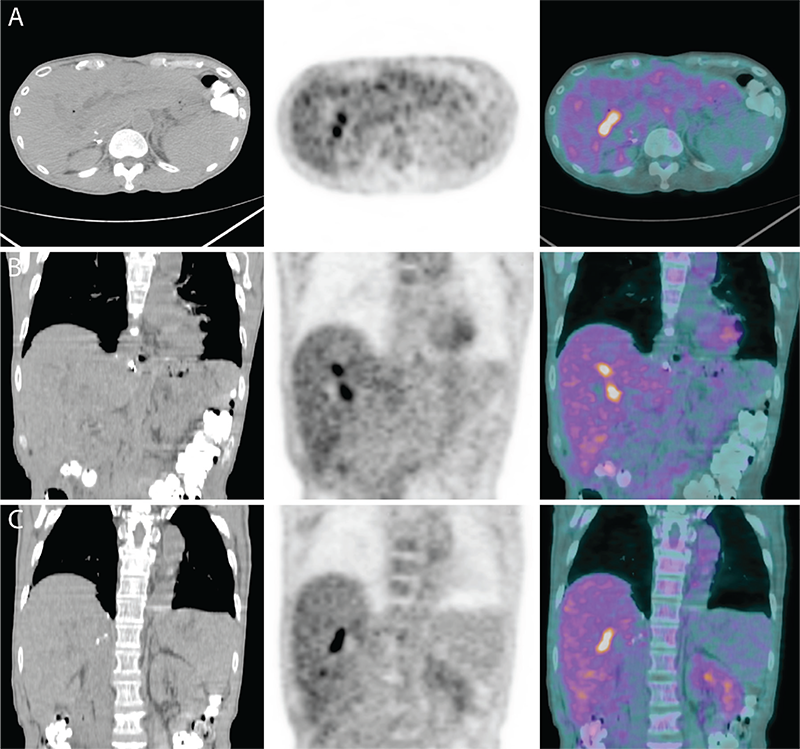 We present the 18F-FDG PET/CT image findings of this case. 1. Patkowski W, Nyckowski P, Zieniewicz K, Pawlak J, Michalowicz B, Kotulski M, Smoter P, Grodzicki M, Skwarek A, Ziolkowski J, Oldakowska-Jedynak U, Niewczas M, Paczek L, Krawczyk M. Biliary tract complications following liver transplantation. Transplant Proc 2003;35:2316-2317. 2. Welling TH, Heidt DG, Englesbe MJ, Magee JC, Sung RS, Campbell DA, Punch JD, Pelletier SJ. Biliary complications following liver transplantation in the model for end-stage liver disease era: effect of donor, recipient, and technical factors. Liver Transpl 2008;14:73-80. 3. Foley DP, Fernandez LA, Leverson G, Anderson M, Mezrich J, Sollinger HW, D’Alessandro A. Biliary complications after liver transplantation from donation after cardiac death donors: an analysis of risk factors and long term outcomes from a single center. Ann Surg 2011;253:817-825. 4. McCormack L, Hany TI, Hubner M, Petrowsky H, Mullhaupt B, Knuth A, Stenner F, Clavien PA. How useful is PET/CT imaging in the management of post-transplant lymphoproliferative disease after liver transplantation? Am J Transplant 2006;6:1731-1736. 5. Takehana CS, Twist CJ, Mosci C, Quon A, Mittra E, Iagaru A. 18F-FDG PET/CT in the management of patients with post-transplant lymphoproliferative disorder. Nuc Med Comm 2014;35:276-281. 6. Mocherla B, Kim J, Roayaie S, Kim S, Machac C, Kostakoglu L. FDG PET/CT imaging to rule out extrahepatic metastases before liver transplantation. Clin Nucl Med 2007;32:947-948. 7. Lee SD, Kim SH, Kim YK, Kim C, Kim SK, Han SS, Park SJ. 18F-FDG PET/CT predicts early tumor recurrence in living donor liver transplantation for hepatocellular carcinoma. Transplant Int 2013;26:50-60. 8. Frohlich A, Diederichs CG, Staib L, Vogel J, Beger HG, Reske SN. Detection of liver metastases from pancreatic cancer using FDG PET. J Nucl Med 1999;40:250-255. 9. Bleeker-Rovers CP, Vos FJ, Wanten GJ, van der Meer JW, Corstens FH, Kullberg BJ, Oyen WJ. 18F-FDG PET in detecting metastatic infectious disease. J Nucl Med 2005;46:2014-2019. 10. Kitajima K, Murakami K, Yamasaki E, Domeki Y, Kaji Y, Morita S, Suganuma N, Sugimura K. Performance of integrated FDG-PET/contrast-enhanced CT in the diagnosis of recurrent uterine cancer: comparison with PET and enhanced CT. Eur J Nucl Med Mol Imaging 2009;36:362-372. 11. Kawamura E, Habu D, Higashiyama S, Tsushima H, Shimonishi Y, Nakayama Y, Enomoto M, Kawabe J, Tamori A, Kawada N, Shiomi S. A case of sclerosing cholangitis with autoimmune pancreatitis evaluated by FDG-PET. Ann Nucl Med 2007;21:223-228. 12. Keidar Z, Gurman-Balbir A, Gaitini D, Israel O. Fever of unknown origin: the role of 18F-FDG PET/CT. J Nucl Med 2008;49:1980-1985. 13. Delbeke D, Martin WH, Sandler MP, Chapman WC, Wright JK Jr, Pinson CW. Evaluation of benign vs malignant hepatic lesions with positron emission tomography. Arch Surg 1998;133:510-516. 14. Kawamura E, Habu D, Tsushima H, Torii K, Kawabe J, Ohsawa M, Shiomi S. A case of hepatic inflammatory pseudotumor identified by FDG-PET. Ann Nucl Med 2006;20:321-323. 15. Guglielmi AN, Kim BY, Bybel B, Slifkin N. False-positive uptake of FDG in hepatic sarcoidosis. Clin Nucl Med 2006;31:175.